It’s happened before, I know this because I’ve documented it: I suddenly go from reading Cosmo to reading Literature with a Capital L, from writing haikus about eating donuts to thinking about the future of the novel and nonsense like that. Is it the cafe culture of France, where one finds oneself sitting at those small tables day after day, smelling the cigarette smoke and thinking Deep Thoughts? Is it because I always happen to have loads of time on my hands whenever I am in France? Is there something in the water? Or is it totally and completely due to the constant and easy access to tiny coffees and whimsical chocolates? We loaded up on cute mussel shell, acorn and mushroom shaped chocolates because we just couldn’t resist. While in Honfleur eating whimsical mussel shell shaped chocolates and drinking a tiny coffee, I discovered that I am not the only one whose personality is weirdly affected by the artistic culture of this country. 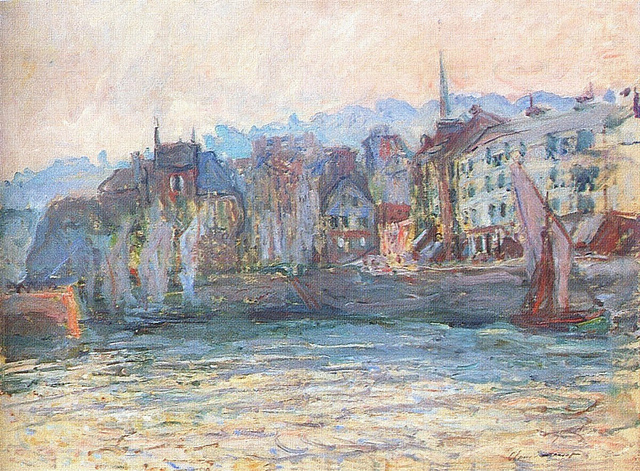 Honfleur is a mecca for the Impressionists (Gustave Courbet, Eugène Boudin, Claude Monet and Johan Jongkind, etc.). The tiny harbor lined with boats and tall wooden houses has inspired painters to portray it time and time again, not caring one bit that they are not the first to paint this recognizable stretch of space much like how I did not care that I wasn’t the first (and won’t be the last) college girl to post a picture of herself reading a book by Patti Smith on Instagram. Anyway, because my family is my family, once we arrived in Honfleur (after a quick kebab lunch), we headed straight for the Erik Satie museum, taking just a few moments to pet a baby horse and walk through the oldest and largest wooden church in France. What a cute lil dude! Saint Catherine’s Church smelled deliciously like pine and had one of the most intricately detailed Nativity scenes I have ever seen. It was also guarded by a cute, tiny dog. Within twenty minutes, Honfleur had won me over with its small animals. France, the queen of interactive museums, did not let us down. The Satie museum has everything: a giant winged pear, a large animatronic monkey, a white self-playing piano, and a whirly-gig pedal operated machine which museum visitors can take for a spin. All of the rooms come paired with Satie’s music and quotes from the man himself, talking about his very, very odd life. The museum is creative, strange and perfect. I felt like I knew Satie personally by the time we walked back out onto the quaint streets of Honfleur. I reflected on the oddball life of Erik Satie while looking at the beautiful Honfleur harbor with my family and came up with a short-term answer to the “qui suis-je” question. Maybe wherever I live, I am a different person who adapts to her surroundings. And maybe in France I happen to adapt to the artiste’s lifestyle. A bit weird, a bit creative, a bit existential. Maybe that’s just the French way. Discussing Satie and impressionists, and drinking the largest coffees we could get our hands on. Follow more of my French adventures. Several versions of this piece are available on YouTube.